During 16 months, between 1961-62, Jack S. Kotschack shook the Swedish establishement by broadcasting radio from a boat anchored in international waters in the Baltic Sea. The radio aired modern pop music, news - and advertising, loved by the Swedish listeners. Politicians however raged and threatened the radio with reprisals and governmental trade boycotts against those companies who advertised through the pirate radio. Behind the scenes intense investigations were ongoing on how to stop the broadcasting. The book is richly illustrated in color with many previously unpublished pictures! 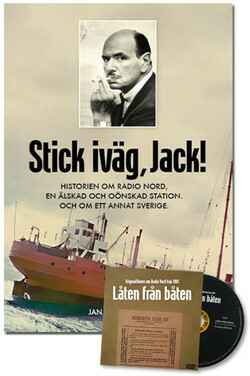 The book's first edition comes with an unique DVD including a documentary film about Radio Nord, entitled "Låten från Båten" (Song from the Boat) - a fantastic time document of 8 minutes play time, which was shown as an opening film at the Swedish cinemas in autumn 1961.